Note: This post has been updated to correct information about AC Transit’s role in the project. Included in People for Bike’s list of “Best New Bikeways of 2017” is one in California: new protected bike lanes along Bancroft Way in Berkeley. These are far from the only new bikeways built in California during the past year that are worthy of celebration, but the lanes in Berkeley are something special. 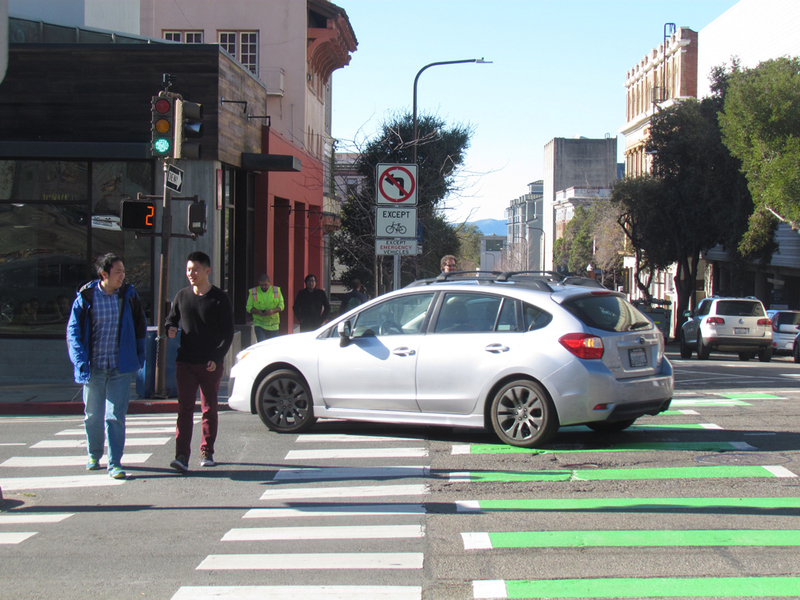 For one thing, they are two-way, parking-protected lanes along a one-way street leading uphill to the UC Berkeley campus, with bike boxes to guide left and right turns and soft-hit posts between the parked cars and the lane. 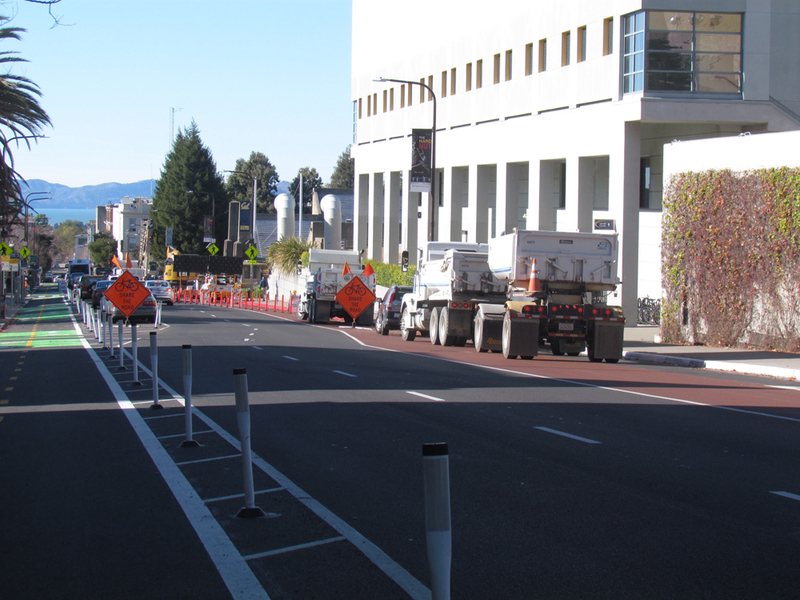 They are also the first “connected protected” bikeway in Berkeley, because they connect to another protected bikeway that runs perpendicularly along Fulton Street. They provide bike riders a new a safe option to get to campus within the severely limited grid of one-way streets south of Bancroft. Riding uphill is now possible to do legally and safely. But the project is also special because it was supported by a broad range of entities, including Berkeley city staff; Bike East Bay, the local bike advocacy organization, who pushed to include Bancroft in the bike plan; AC Transit, the regional bus agency that operates several busy bus lines on Bancroft; UC Berkeley; and the Telegraph Avenue Business Improvement District. Bike East Bay wanted two-way bikeways to circle the UC campus; AC Transit wanted to extend bus-only lanes that currently run a few blocks down Bancroft. With the city, they came up with a plan that would include both, moving the two-way parking-protected bikeway to the left side of the street and putting a red-painted bus-only lane on the campus side. In a victory for the All Powerful Bike Lobby, a representative for AC Transit told the Berkeley City Council that they needed “the political support of the bike coalition” to get the bus lanes they wanted. On top of all that, Bancroft was also narrowed, which makes crossing much easier for pedestrians. This section formerly had a slightly confusing configuration of two to three lanes, all going in one direction, which tended to encourage drivers to speed around each other on the downhill. Now cars have two lanes to drive in, buses have their own lane, and bikes have a two-way bikeway protected by a row of parking. The street is not perfect. Yet. People still park in the bus lane. Bicyclists riding downhill have to navigate over to the left side of the street to enter the lanes, although there are clear markings to help them figure out where to go. Left turns were eliminated for cars from Bancroft onto Fulton, but it is taking a while for that new pattern to sink in. Car drivers are used to being able to make a series of left turns that sweep them back up towards campus in a search for nonexistent street parking. It is way too easy to get photos of cars turning left where they’re not supposed to. But one of the best things about the project is that it is a work in progress. Future phases—some of which have been approved already by the Berkeley City Council, and all of which have funding lined up—include a two-way bikeway on Dana, which tees into Bancroft, and improvements along four blocks of Telegraph Avenue as it approaches the campus. AC Transit got funding for many of those improvements to help its buses move more efficiently along there, but the streets will be better for everyone. Those improvements are planned for 2018. Future plans include extending the two-way bikeway all the way up Bancroft to the top of campus at Piedmont Way. Meanwhile there is still work to do on the current project. A turn box for bikes needs better signage, and the city may have to consider moving the “no left turn” sign into the intersection, because so many cars seem not to see it. A curb still needs to be painted red to make it clear that cars are not supposed to be parking where it looks like a metered spot, even though it is right on top of the green-painted bike lane. The city plans to collect data and issue a report about the project once it is complete and people have been using it for a while. 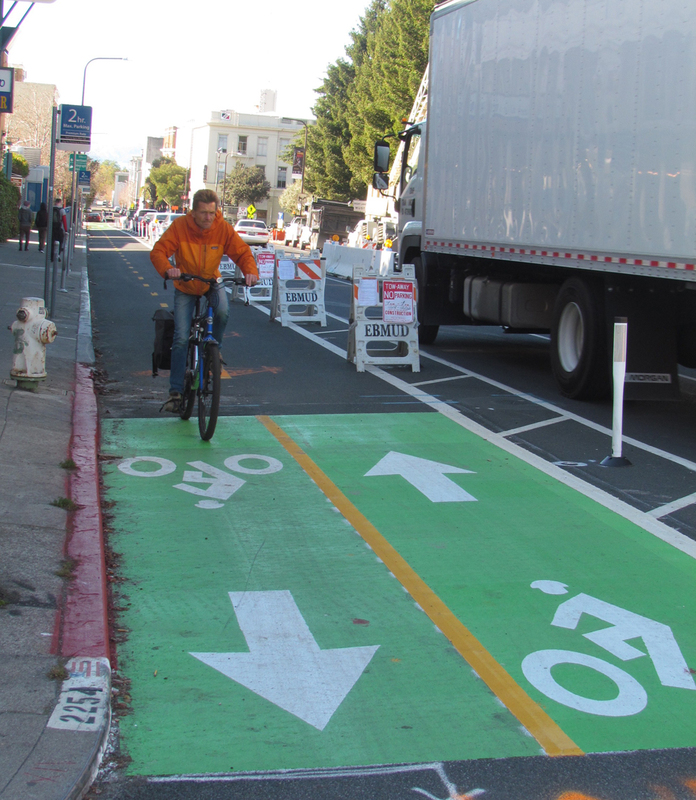 Bike East Bay is doing its own evaluation to augment the city’s data, including a survey on how riders like the lanes and what needs improvement. On the day these photos were taken, traffic was slowed not by a road diet but by construction, which blocked the bus lane. The other side of the street is a red transit-only lane downhill, and Berkeley is updating its municipal code to allow people to bike in it, so the end result is even better: a two way cycletrack on the south side and a shared bike/bus lane on the north side. The south side of the street is mostly retail whereas the north side is mostly blank, university frontage, so by having the cycletrack on the south this makes it easier for bike riders to reach the shops from both directions without having to cross multiple travel lanes. And if one is turning left at the end of the cycletrack, this also enables them to do so without having to merge across lanes. There is a right turn queue box to wait in before a turn north onto Oxford from the cycletrack, if the light isn’t already green, or one can make a right from the north side of the street like you mentioned. The cycletrack, buffer, and transit lane also resulted in travel lanes narrowed down to 10′, which has calmed vehicle speeds and increased yield rates to people crossing Bancroft on foot as well. It is a great facility that provides access for lots of different bike riders, allowing them to make a decision on where to ride based on their personal preferences and destination. While the Downtown Business Association of Berkeley did enthusiastically support this Bancroft Way project, it was the champion support of the Telegraph Business Improvement District that led the way. Thank you Suart baker and the Telegraph BID—Happy Holidays! Nothing about this design prevents a bicyclist from riding downhill in the lane shared with cars. One essential next step has not been approved yet and is not mentioned in the article: we need to extend this bike lane two blocks further west on Bancroft to connect it with Milvia. Currently, this bike lane is connected with the area to its southwest in only one direction. You can bike west on Bancroft and then turn south into the bike lane on Fulton. But since Fulton and its bike lane are one-way, there is no safe way to bike in the opposite direction. We need to extend the bike track on Bancroft two blocks west to connect with the bike boulevard on Milvia (where the city has begun work on creating another bike track). Then people coming from the southwest will be able to bike north on Milvia to Bancroft and turn east on Bancroft. If it’s downhill for the same-direction bike traffic, I honestly don’t see the reason to even make it a two-way facility. It would be better as a contraflow one-way facility and let same-direction bicyclists use the travel lanes.